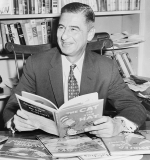 Dr. Seuss was a pseudonym used by the American writer and cartoonist Theodor Seuss Geisel (March 2, 1904 – September 24, 1991). He was most widely known for his children’s books. He had used the pen name Dr. Theophrastus Seuss in college and later used Theo LeSieg and Rosetta Stone. Marco imagines an elaborate fantastical parade traveling along Mulberry Street. A collection of puzzles to test your I.Q. This edition combines the two volumes. A collection of puzzles to test your I.Q. King Derwin is tired of the same old weather. He tells his magicians to make something new. Fortunately Bartholomew is on the job when the oobleck begins to fall. Seven short stories by Dr. Seuss. A cat in a hat comes calling and makes a mess. The Cat in the Hat is up to more mischief. A large collection of classic picture books. Sam I am wants me to eat his green eggs and ham. The six-and-a-half-foot Birthday Bird of Katroo is bringing a happy birthday to you! More nonsense from Dr. Seuss. Four short stories by Dr. Seuss in which we meet some old friends. When Mazie asks Horton to keep her egg warm, he did not expect that she wasn’t coming back. The Grinch can’t stand to see the Whos down in Whosville preparing for Christmas. I am sure Mr. Sneelock won’t mind when he finds he’s a rather large circus behind. When the King’s stilts disappear he loses interest in fighting the Nizzards and the Kingdom is in danger of sinking.